The PWA World Tour has set up shop on the sun drenched beaches of Bonaire in the Dutch Caribbean, as the world’s hottest freestylers prepare to battle it out in the final event on the 2003 calendar. As the anticipation reaches a mouth watering climax to the 2003 PWA overall season, the stage is all set for the champions to be decided in both men’s and women’s categories. With temperatures in the mid eighties, ice blue mirror flat water and steady trades blowing throughout the year, Bonaire has firmly established itself as the ultimate freestyle location and a hot favorite with sailors on the PWA tour. Over the next seven days, we will no doubt be seeing action of the highest caliber as the finest freestylers in the world demonstrate their flat water skills in front of the international judge’s panel. In heats which usually last around five minutes sailors will be judged on style, variation, degree of difficulty and overall impression as they perform their routines in a knock out double elimination. Following sensational events in Pozo, Gran Canaria and Sotevento, Fuerteventura, the men’s PWA freestyle tour has two sailors sharing the number one slot in the overall rankings. JP, Neil Pryde team mates, Ricardo Campello of Brazil and Robby Swift from the UK both nineteen have one victory to their names and are undisputedly the two favorites to take the title. However, it is essential that both sailors clock up solid performances here at the final event of the season as the fleet is stacked with talented sailors, all breathing down their necks in a position to steal the coveted position as the PWA overall champion. Other sailors with podium potential here in Bonaire include local freestyle virtuosos Tonky and Taty Frans (Gaastra, AHD), Kauli Seadi (Naish, AHD) the Samba sensation from Brazil, Diony Guadagnino (Neil Pryde), the Venezuelan maestro and Colin Sifferlen (Starboard) the rising star from New Caledonia. In the women’s race for the overall title, Karin Jaggi (F2, Arrows), Daida Moreno (Mistral, North) and Iballa Moreno (Mistral, North) are all locked in battle with only a few ranking points separating all three sailors. Daida Moreno clinched a vital victory at her home break in Pozo but Jaggi fought back in Fuerteventura to make it one apiece with Iballa Moreno staying in well contention by placing on the podium at both events. Daida Moreno, Iballa and Karin Jaggi joined forces in a triple birthday celebration with fellow female competitors here in Bonaire last night. The twins arrived five days ago and the trip was nearly cut short for Daida who sliced her knee wide open during her pre event training practice. She was rushed to hospital, treated with fourteen stitches and fortunately has been given the green flag to compete although she will probably be the only sailor wearing a wetsuit during competition. Last years event saw local hero Tonky Frans (Gaastra, AHD) take the first ever King of the Caribbean title after a close run battle with Matt Pritchard (Gaastra, AHD) and Ricardo Campello. 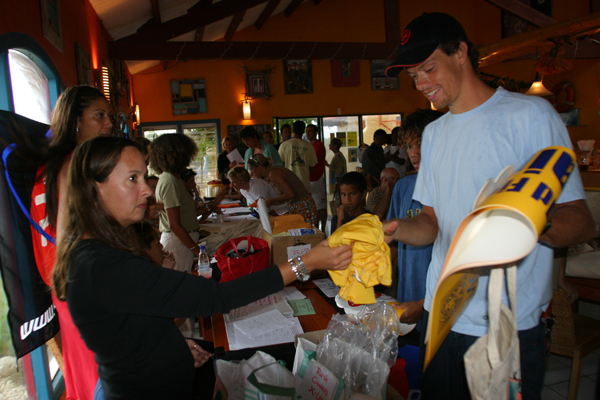 Tonky and his brother Taty have been a huge source of inspiration to hundreds of young kids who have taken up windsurfing and produced a huge melting pot of talent here in Le Cat bay. Many of the kids will be competing alongside the pros in a special amateur event running throughout the course of the week. Despite a few drops of rain today, the forecast for the next few days are the same as it is here in the Caribbean almost every day of the year. Wall to wall sunshine, temperatures in the mid eighties and trades blowing 10-20 knots…in a word paradise! Stay tuned for all the news, pictures and results brought to you daily on the PWA web site www.pwaworldtour.com.